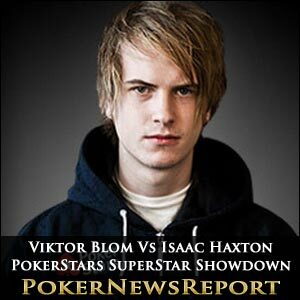 Online poker specialist Viktor ‘Isildur1’ Blom is preparing to once more face conqueror Isaac ‘philivey2694’ Haxton in the latest installment of the SuperStar Showdown high stakes game at PokerStars on Sunday. Sensational Swede Blom will again play American Haxton – who in January added $380,730 to his ever-growing bankroll for finishing third in the PokerStars Caribbean Adventure (PCA) $25,000 buy-in No-Limit Hold’em Eight-Max High Roller event on Paradise Island – over 2,500 hands of high stakes heads-up play at 17:00 GMT (Greenwich Mean Time). The weekend clash will, however, see the stakes doubled from $50 and $100 to $100 and $200 as both players put up $300,000 to play over four tables of No-Limit Hold’em. The victor will be the player in profit at the conclusion of the challenge – or the one who survives the longest before the other loses all of their $300,000 bankroll before the SuperStar Showdown ends. Blom – who took down the PCA’s $100,000 buy-in No-Limit Hold’em Super High Roller event back in early January for an impressive $1,254,400 – has an enviable record in the SuperStar Showdown matches, having a 9-2 success rate following his first match-up loss to Haxton. That inaugural challenge saw Las Vegas-based Haxton – who is nicknamed The Lizard King – win $41,701 back in December of 2010, although he was quick to point out that he had to battle hard just to stay ahead of his rival. Haxton – who was born in New York City but grew up in Syracuse – said of Blom: “No one has ever more consistently made me miserable when playing against them. Blom – who has lost just one more of the challenges, to Canadian superstar Daniel Negreanu, for $26,500 – will undoubtedly be gunning for revenge this weekend, so it is easy to see why Haxton is readying himself for another war of attrition. The Swede’s incredible run of success has also seen him beat out competition from Team PokerStars Pro Negreanu, Team PartyPoker Pro Tony G, Daniel ‘Jungleman’ Cates, Eugene Katchalov, Attila Gulcsik, Scott Palmer, ‘Mastermixus’, Rui Cao and Terje Augdal. If you are interested in watching the challenge play out, get over to PokerStars on Sunday, select ‘Hold’em’, and then ‘No-Limit/Pot-Limit’ to locate the poker games listed under ‘Showdown’ tables. Now, as well as being able to watch all the thrilling action, players can also take on Blom in a SuperStar Showdown. If you reckon you’ve got the skills – as well as the determination and stamina – then email showdown@pokerstars.com and lay down the gauntlet. However, make sure you are serious about the challenge as only those offers that are considered sensible will receive a response from PokerStars.